Welcome to Snapshot Cooking, the home of Kitchn鈥檚 easiest recipes. These mini recipes are so simple you can practically cook from the before-and-after snapshot itself. I鈥檓 a firm believer that a box of frozen puff pastry is the ultimate fast and fancy ingredient. The inexpensive sheets are wildly versatile, and emerge from the oven boasting buttery, flaky layers. With a bit of inspiration and a few minutes of prep, you鈥檝e got something wonderfully delicious (and impressive) on your hands. You鈥檝e likely used puff pastry to make appetizers, dinners, and desserts, but my favorite way to use it is in sweet and savory breakfast treats. 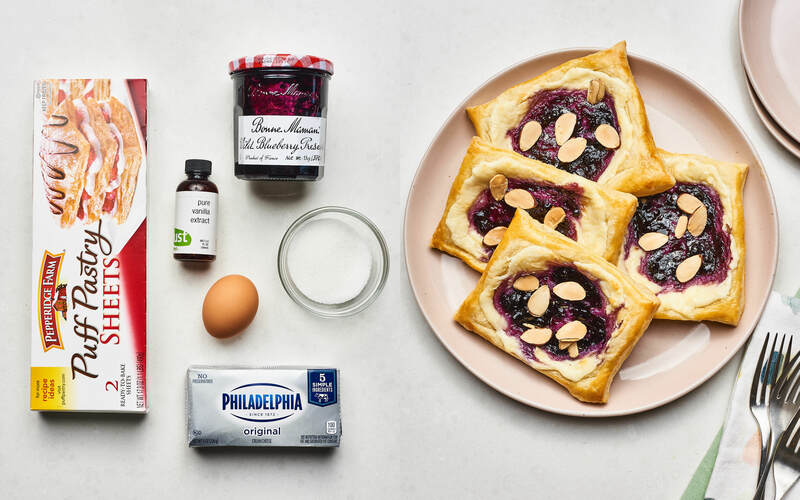 Here鈥檚 how I use puff pastry to make everyday breakfasts feel a little more special, or instantly dress up a spring brunch. 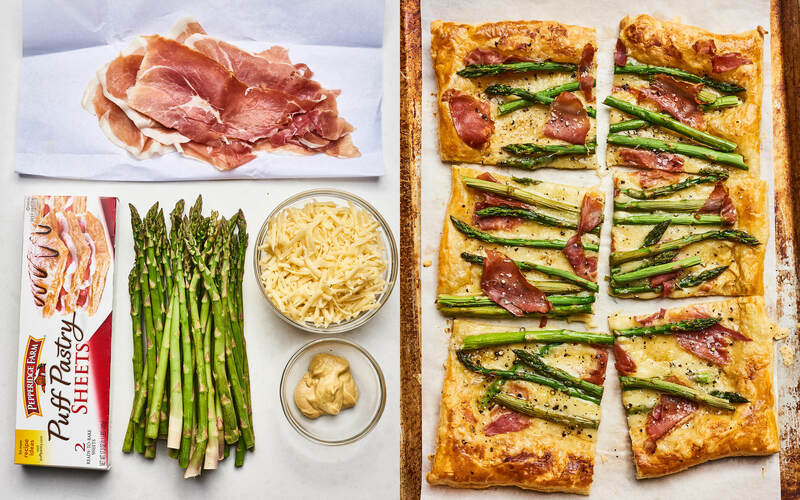 The puff pastry: Each recipe starts with a 17-ounce box of frozen puff pastry that contains two sheets. The puff pastry should be thawed according to the package instructions before using, and it鈥檚 best thawed in the refrigerator if possible. 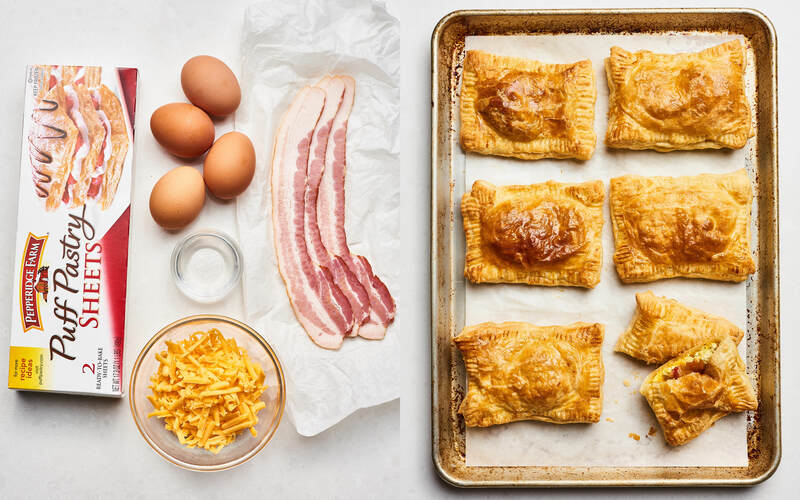 While these recipes use Pepperidge Farm Puff Pastry, any brand will work. Unfold 2 thawed sheets puff pastry on a lightly floured surface. Cut each into 6 rectangles. Place half on a parchment-lined baking sheet. Leaving a 1/2-inch border, top rectangles with 1 heaping tablespoon shredded cheddar cheese, 1/4 cup scrambled eggs, and 1/2 strip cooked bacon. Brush water around the borders. Top with remaining puff pastry pieces; crimp edges with a fork. Cut a 1/2-inch slit in the top of each. Transfer to the refrigerator to chill while the oven heats. Heat oven to 400掳F. Bake until puffed and golden-brown, 20 to 25 minutes. Eat immediately, or store in the refrigerator for 3 days or freezer for 3 months. Heat oven to 400掳F. Mix 8 ounces softened cream cheese, 3 tablespoons granulated sugar, and 1 teaspoon vanilla extract in a bowl until smooth. On a lightly floured surface, roll out 2 sheets thawed puff pastry to 2 (12脳9-inch) rectangles. Cut each sheet into 6 rectangles. Use a sharp knife to lightly score a border around each piece about 1/2-inch from the edge (do not cut all the way through). Prick the center of each piece several times with a fork. Transfer rectangles to a parchment-lined baking sheet. Spread 2 tablespoons cream cheese mixture in the center of each piece. Top with 1 heaping teaspoon jam. Brush egg wash (from 1 beaten egg) around border of puff pastry. Bake until puffed and lightly browned, 15 to 18 minutes. Place 2 thawed, unfolded sheets puff pastry on a lightly floured surface. (If unfolded, fold lengthwise into thirds). With a rolling pin, gently roll each sheet to just over 12 inches long. Use a donut cutter or 3-inch cookie cutter to punch out circles, then cut a hole in the center of each using a 1-inch cookie cutter. (You鈥檒l get 4 donuts per sheet). Roll out scraps to make 2 additional donuts, if desired. 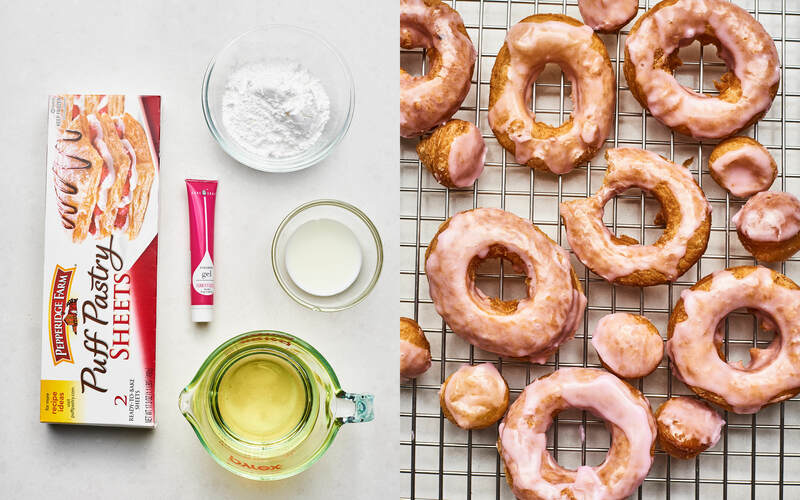 Chill donuts and holes on a plate in the refrigerator while oil heats. Heat 2 cups peanut or vegetable oil in a Dutch oven or heavy-bottomed pot over medium heat to 375掳F. Working in batches, add donut rings to the pot. Cook until bottoms are lightly browned, 2 to 3 minutes. Flip and cook until the other sides are browned, 2 minutes more. Remove donuts using a slotted spoon; transfer to a paper towel-lined plate. Let cool completely. Fry the donut holes, flipping halfway, about 2 minutes total. Whisk together 1/2 cup powdered sugar and 1 tablespoon milk in a wide bowl. Tint with food coloring. Dip one side of the donuts into the glaze; place glaze-side up on a wire rack. Let sit until glaze firms, about 10 minutes. Heat oven to 400掳F. Unfold 1 sheet thawed puff pastry onto a lightly floured surface. Roll into a 10脳16-inch rectangle. Transfer to a parchment-lined baking sheet. Spread 2 tablespoons Dijon mustard on the pastry, leaving a 1-inch border. 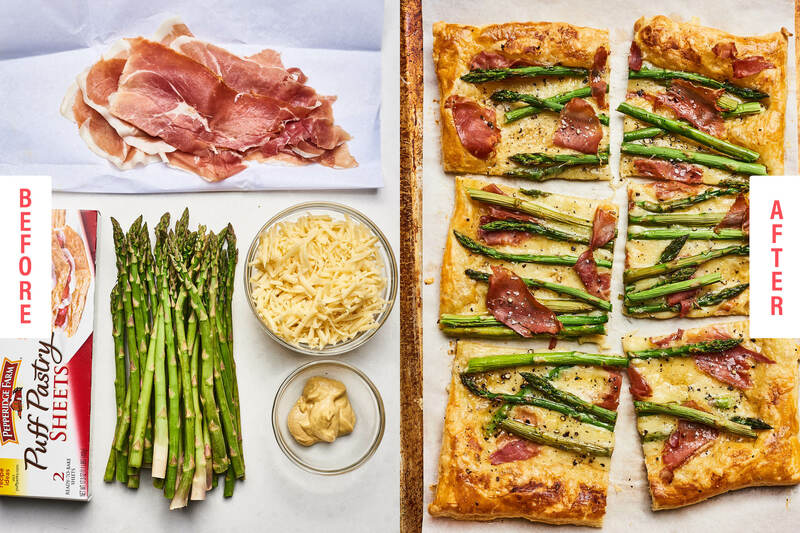 Top with 1 1/2 cups grated fontina cheese, then 1 pound trimmed asparagus in a single layer. Top with 6 thin slices torn prosciutto. Bake until puffed, lightly browned, and cheese is melted, 20 to 25 minutes. Heat oven to 400掳F. Unfold 1 sheet thawed puff pastry on a lightly floured surface. Brush dough with a thin layer of egg wash (from 1 large beaten egg). Sprinkle with 3 tablespoons packed brown sugar (light or dark) and 1 teaspoon ground cinnamon. Starting at the long side of the rectangle, tightly roll up the puff pastry. Use your fingers to tightly seal the seam. Cut crosswise into 8 pieces. Place on a parchment-lined baking sheet. Repeat with the second sheet of puff pastry. Brush outside of rolls with remaining egg wash.
Bake until puffed and lightly browned, 20 to 25 minutes. Cool completely on a cooling rack. Whisk together 1/4 cup powdered sugar, 1 to 2 teaspoons milk, and 1/2 teaspoon vanilla extract. 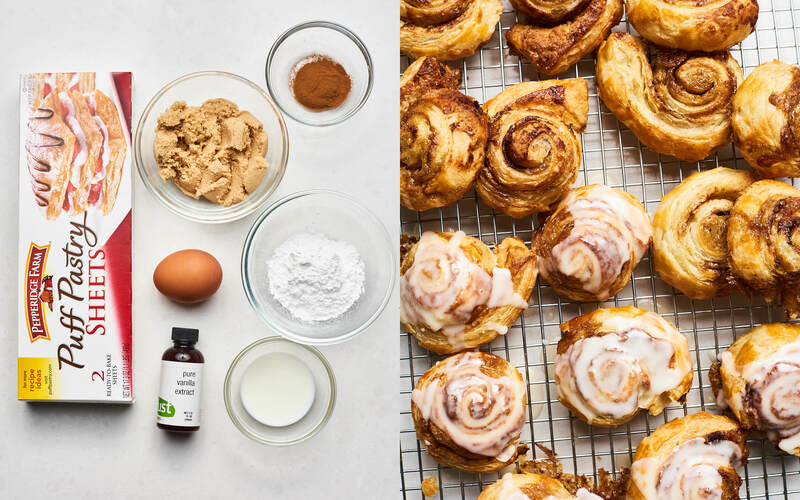 Drizzle over cooled cinnamon rolls.